Today I am celebrating a marker, today is the day which marks my sobriety date. I’m now 3 years sober and believe me when I say a different person because of it. Sobriety has given me freedom, hope and a chance to get to know myself without a crutch or the safety of a mask to hide behind. To honour this auspicious occasion I’ve asked some of my sober sisters to share with us a statement of what sobriety has meant to them. May these words from Sober Women bring hope to those needing it. When I saw this post, I smiled. I see a strong, powerful woman full of passion and joy! A young girl in Al-Anon meeting last night wanted to understand how recovery has helped us find our passions in life. I was struck hard with memories of what it used to be like living in my world… and what it is like today. I feared that letting go of the drama and control (the illusion of control) would make me a boring person and leave me with nothing. Perfectionism leaves no room for passion. But exactly the opposite is true. Because I have shifted the focus to myself, I know exactly what I am passionate about. And like the Runaway Bride, I know how I like my eggs. Simply beautifully put Debroah, thank you so much for sharing here!!! Congratulations Julie! And Happy Anniversary! Awesome. Isn’t being sober a strange but wonderful buzz. I’ve tried to quit smoking without much success… yet. I commend you Julie, and all of the strong women that have posted here, on your commitment to sobriety and changing your lives for the better. It takes a much bigger person to quit something than it does to keep doing it, you are inspiring! 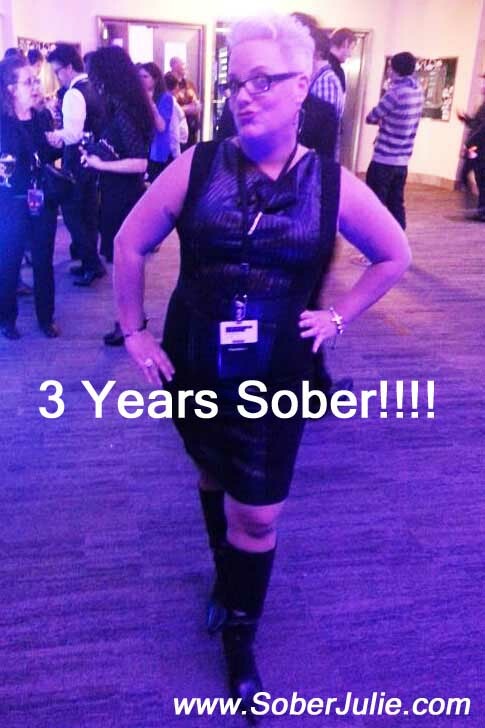 Congratulations on 3 years of sobriety. Keep on keepin’ in mama!!! Congratulations Julie. I commented on you FB post last night & I would like to again. The road is not always an easy one. My Mom is 30+ years sober & I know that it was a struggle for her at times but she has made it through (not even communion wine). Unfortunately she lost friends along the way who didn’t understand that “No, I can’t have JUST 1 glass of wine” but she has also made new friends along the way. Here’s to many more sober birthdays for you! Congrats Julie!!! You’re an awesome chick inside and out. Beautiful! Congratulations my sober sista! Three years feels great doesn’t it! I am grateful for each day of sobriety, and I am grateful for awesome sober women like you! Keep walking the walk girl! And I must get a copy of “mocktails”! Yeah for you Julie. What an accomplishment, and I am so glad you were able to write this post. May you continue your awesome lifestyle and be the best Julie you can be! A BIG happy birthday to you! I find the new “trip” in my life is living clean! So excited for you!